Could you speak a bit about how you sustain your commitment to go to your loom to create the beautiful things that you make? I find it so difficult to find time in my busy week to take out a few hours to weave. Everything seems to call out to me for my attention that I can’t find time to weave. It’s really frustrating. My first thought was: my situation is different from hers. Weaving is my job; it’s not something I do in addition to a full time job teaching high school biology. Then I thought back to the time before weaving was my job and remembered. When I first learned to weave, I rented a small table loom from my teacher. Then my mother kindly bought me a floor loom from a friend. At first it stood in the bedroom, taking up a good chunk of space. I walked past it several times a day. I was more comfortable knitting on the soft sofa with the dogs snuggled beside me. The truth is my loom intimidated me with all its parts and the many steps involved in setting it up. Plus the wooden bench was hard and offered no back support. So I knit and read about weaving. I eventually embarked on my first independent project: kitchen towels. I selected a pattern from a magazine, chose my own color combination and ordered the cotton. I carefully followed all the instructions and consulted a book when I needed help. The weaving was slow and the rhythms unfamiliar. I worried about making mistakes, about the tension, about my selvedges. I remember the excitement of unrolling that bolt of five towels from the loom. The yards of handwoven cloth stretched from the back door into the kitchen. Six years later, I still use the two towels I kept. Much has changed since I wove those first kitchen towels. I have claimed the dining room as my studio. I have logged more than a thousand hours at the loom and I feel competent. The loom is no longer intimidating. It calls to me and I delight in the rare days on which I weave to my heart’s content. What keeps me returning to the loom day after day? There’s the wonder of a new project and curiosity about color combinations. There’s the deep satisfaction of creating something beautiful and useful with my hands, and the joy of starting with hundreds of individual threads and ending up with cloth. There’s the calming rhythm of treadle-throw-beat that helps any worries and frustrations dissipate. More than anything though, there’s a feeling of rightness when I weave. A rightness that comes from the rhythms of weaving and the fact that weaving – and particularly weaving kitchen towels – combines so many things that I’ve loved since I was a child. I feel like I have come home to myself. I learned to weave at a time when I was making changes in my life. My fortieth birthday brought with it the decision to live my life, to do more of what I wanted and less of what I thought was expected. The decision deepened when, two years later, my sister died of leukemia. When family gathered to bury some of her ashes nine months later, my cousin Katharine asked me what I was doing these days. “Weaving,” I said. “Weaving what?” “Kitchen towels!” We both laughed. The following day, when she saw a couple of them, she said, “Oh, this means you can weave towels to go with my kitchen.” And so Whimsy & Tea was born. To answer my friend’s question, my commitment to my loom is an affirmation of the decision to live my life. As a young girl I had no idea I could make a living based on my love of handwork. 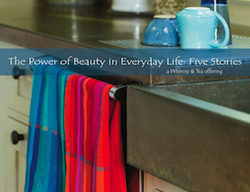 But now, in my forties, I choose to use my love of color and pattern to weave beautiful towels to bring beauty and joy into the kitchens and lives of others. I choose it over and over. I choose it every time I sit down at the loom. My invitation to you: What’s one choice you have made that brings you home to yourself? I’d love to hear.